Over fifty years of growing cacti and other succulents has given me experience and understanding of their needs. Over twenty years of showing and displaying with the British Cactus and Succulent Society (bcss.org.uk) has given me an insight into this fascinating world of succulents. I have travelled to Argentina to see plants in habitat. We do many talks and slide shows up and down the country so please view our talks list. Thirty years of teaching and educating children, she was introduced to cacti at a very early age. Her father, Ray, was one of those present at the inaugural meeting of the Birmingham branch of the BCSS. There is a purple streptocarpus plant, Vicki, named after her. 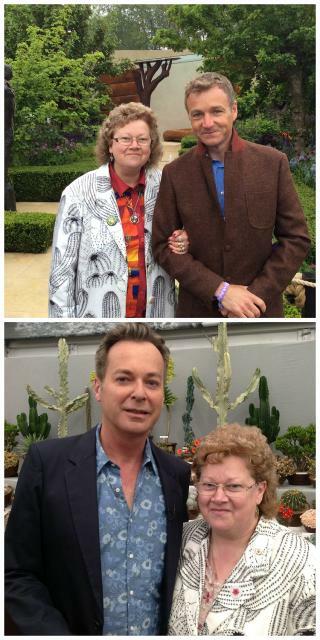 Speaking on raising cacti and other succulents on television with Monty Don was something she really enjoyed. Educating and informing others on how to grow and enjoy these plants is most important, there are too many misconceptions with regards to them. Stamp collecting and selling stamps are other interests she has out of season so if you are so inclined get in touch. We have had notable visits from celebrities to the Craig House Cacti stand over the years and they include:-! Chris Beardshaw, Carol Kline, Tom Hart-Dyke, Frank Hardy, Diarmuid Gavin, Monty Don, David Bellamy, Roddy Llewellyn, Anne-The Princess Royal, Camilla-Duchess of Cornwall, Julian Clary, Sophie-Countess of Wessex, Christine Walkden, Andrew Lincoln, Bill Nighy, Nigel Havers, Ainsley Harriott, Ross Brawn, Piers Morgan, Charlie Dimmock, Moira Stewart, Ann-Marie Powell. Julian Lloyd Webber, Sophie Raworth, Brandon Cole, Anton du Beck and Joanna Lumley.